Rugged or comfortable, luxurious or cozy, bedrooms can become the wonderland in which all your passions collide. Rustic details make it homier because of familiar textures and colors. Mix and match textures, patterns, colors, materials and light and see how magical your bedroom can become! Think about warm winter nights, when the sensory and the visual meet – just before you go to sleep. By adding a few few rustic details to your bedroom – like warm fluffy blankets and rugs or a naturally rugged dresser – your winter wonderland will be prepared to comfort you at night after a long day of walking in the cold. 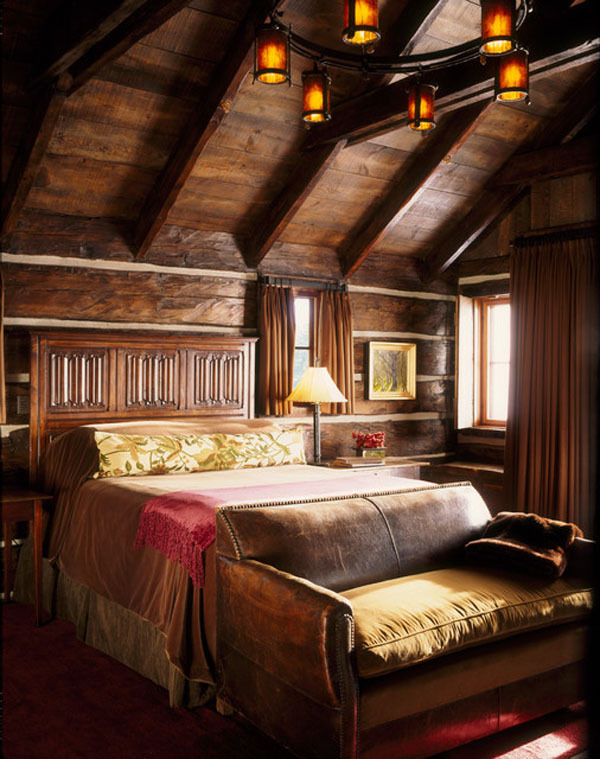 Rustic bedrooms have design elements that range from heavy wooden beam ceilings to softly colored patterns. There are so many ways to add a bit of earthy charm to your bedroom, I’m sure our list of 21 cheerfully modern rustic bedrooms to inspire your winter will whet your appetite for more natural textures this coming season. 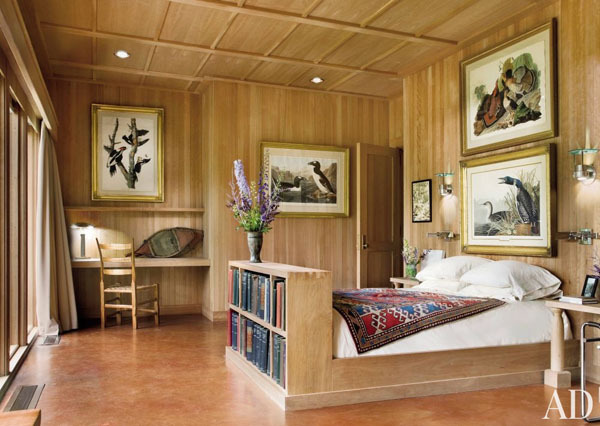 This is how Dan Joseph Architects describe their work:“Carefully blending a world defined by orderly needs of program and the random artistry of nature in the extreme.” Seeing the bedroom above with its bold logs and southwest-style area rug, we understand what they mean. 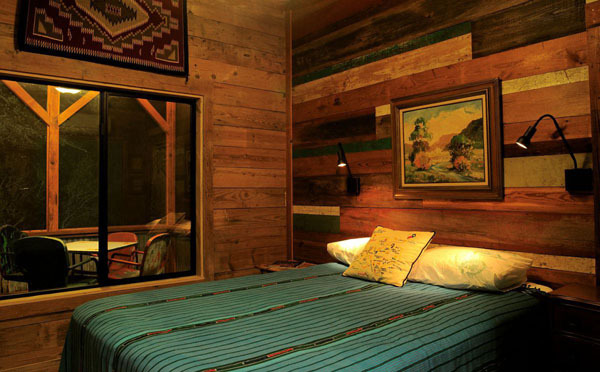 Inside a beautifully custom-designed cabin, this inviting bedroom proves that although difficult, energy efficiency can be reached in a rustic environment. 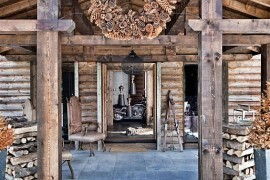 No wonder the Headwaters Camp Cabin in Big Sky, Montana is Mountain Living’s ‘Most Responsible’ Residence of the Year. A modern canopy bed matched with wooden tables and a fluffy white rug are accentuated in a naturally lit space. Photographer Audrey Hall captured the contemporary stillness of this modern bedroom with rustic influences. The blanket and two horses conjure galloping images of farm life, where infinity and the present moment are intertwined. 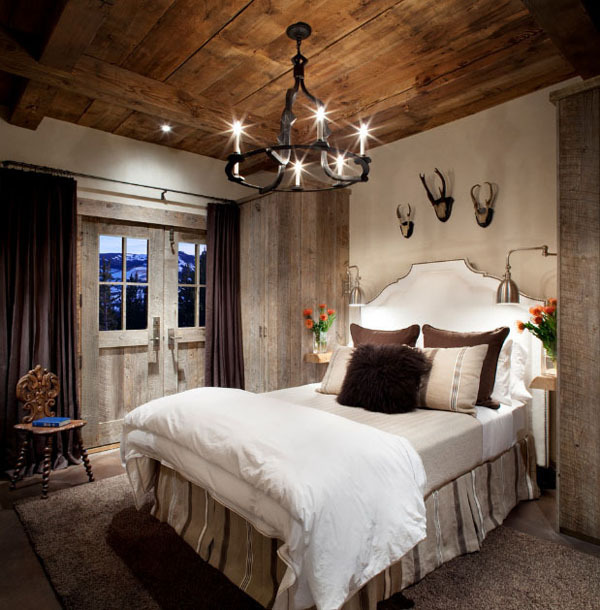 The Lower Foxtail Residence by Reid Smith Achitects & Teton Heritage Builders features a contemporary bedroom with rustic hints. This bedroom design is part of LC2 Design Services’ portfolio – an example of powerful modern sophistication achieved using dark colors and organic details. This Montana home feels warm and welcoming, contrasting the cold outdoors. Even a boring white bedroom can be upgraded to a welcoming space with rustic elements. 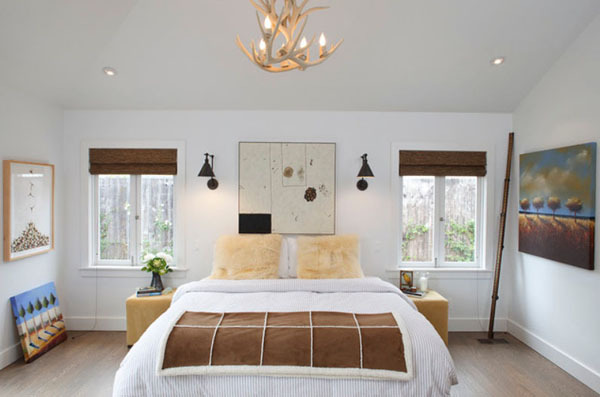 Under an antler chandelier, the bed looks pristine, and furry pillows lit from above at night and sunken in sunlight during the day appear cozy and inviting. 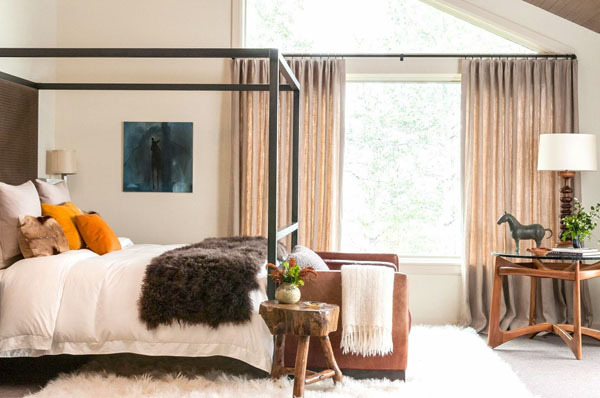 Colorful art repeats a natural theme, and what you can’t see in these photos is that a barn door separates the bedroom from the rest of this Mill Valley home designed by Artistic Designs for Living. 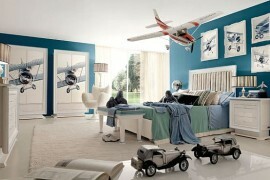 This is a kids bedroom designed by Luis Jauregui, where strong colors like red, yellow and blue meet a softer palette. Warm wood furniture alongside cheerful decor ensure the kids have a welcoming environment. A bedroom dressed in wood from head to toe can sometimes feel heavy, but with the right color choice and design lines, wood can be magnificently displayed in all its glory. 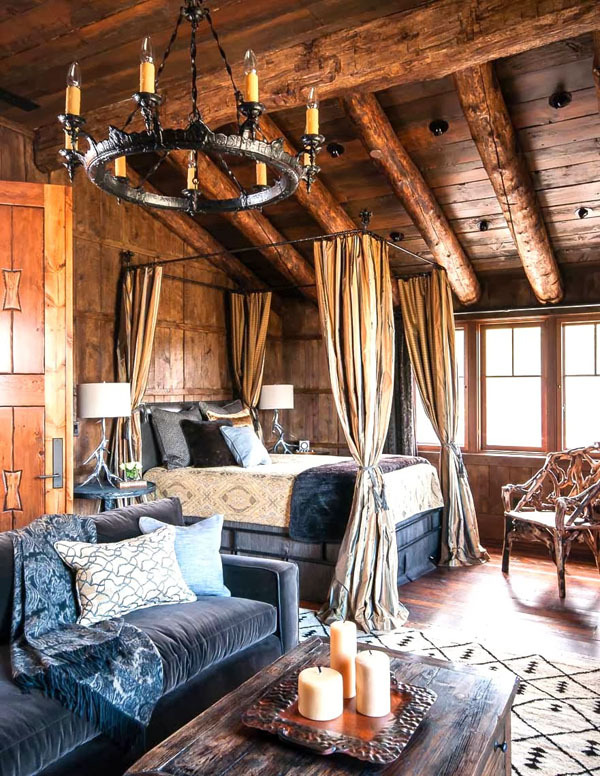 Blending modern and rustic in a welcoming bedroom with built-in furniture was Allan Shope‘s way of showcasing black cherry wood in his Amenia, New York home. This beautifully designed guest bedroom imagined by Peace Design encompasses elegance and cozyness in a compact rustic setting. An iron chandelier on the wooden ceiling hangs over the inviting bed. Pristine sheets contrast the textured wooden panels, while the choice of natural colors and the presence of colorful flowers bring the rustic bedroom into a serene atmosphere. Rustic might sound simple, but when you want to have a bedroom that captures the essence of romance and natural comfort, an eclectic design might be the answer you were looking for. Also imagined by Peace Design, this particular bedroom features a full wooden skin on the inside, making you feel safe and warm, while luscious materials attend to the romantic side of the design. 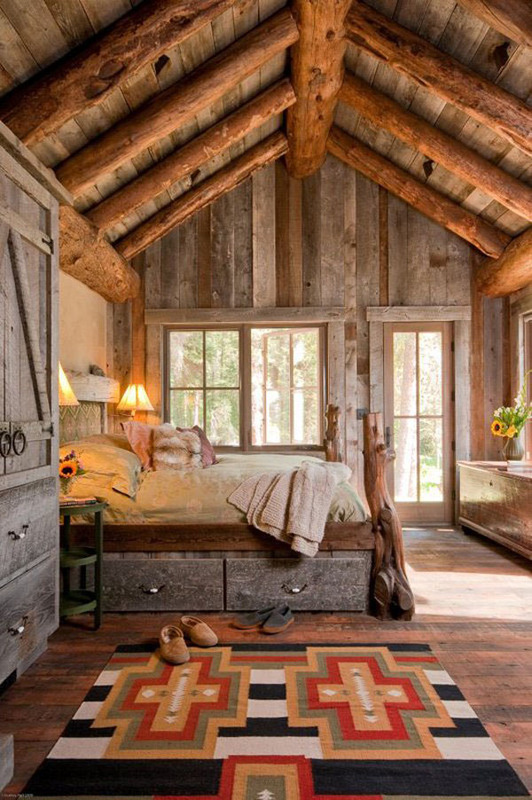 Imagine you had a canopy bed with luscious curtains under a log ceiling inside a bedroom built for love and rest. In this example photographed by Audrey Hall, the iron chandelier, the candles on the table and the blue velvet sofa are details that induce romantic, almost royal feelings balanced by the warmth of the wood and the abundance of natural light. 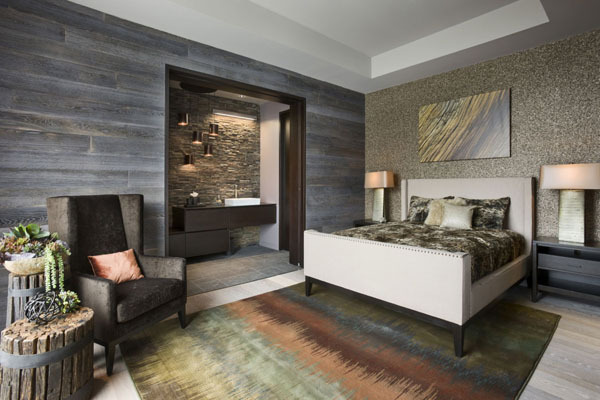 If you like a heavier rustic look in your bedroom, the example above shows the way stone and wood can be adapted to shape modern design while keeping a rustic feel. 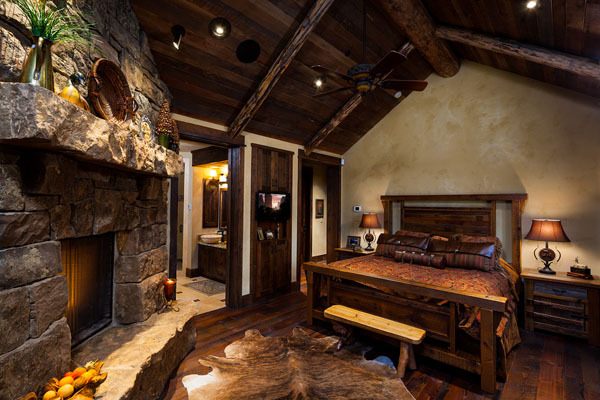 Part of a home built entirely out of rustic logs and reclaimed materials – the Lower Foxtail Residence – this bedroom designed by Teton Heritage Builders provides inspiration for those who absolutely love this combination of materials. The “La Arboleda” retreat cabin by Reclaimed Space showcases a simple way to have a minimalist rustic bedroom made from recycled and salvaged items that used to be part of old barns and houses fit for demolition. 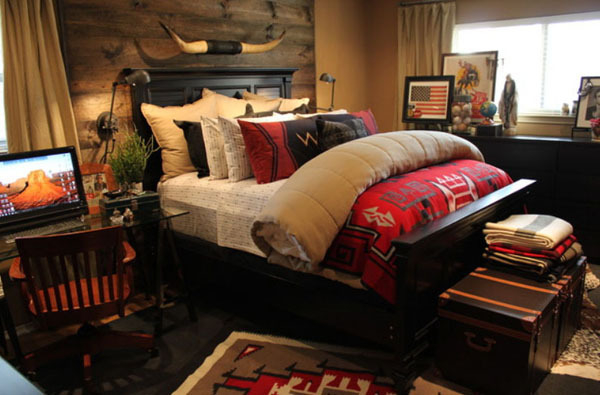 Red and black were used to compose a bold rustic design in this master bedroom. Seen in the bedspread, rug and decorative items, this red/black duo spotted on the Cavender Diary was chosen to infuse the space with color. Matching the dark wood, bull horns above the bed grab the attention in a dark and powerful way. 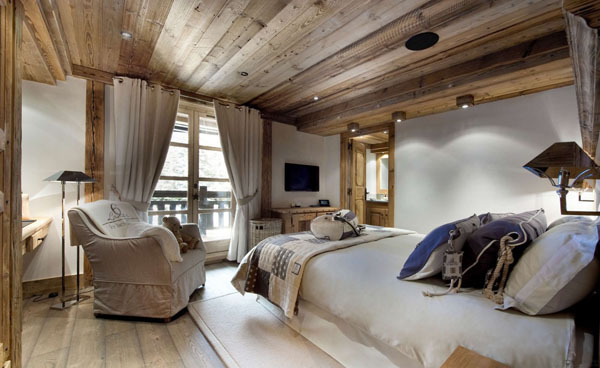 Our first example of a luxury rustic bedroom comes from an elegant ski chalet in Courchevel, the French Alps. Chalet le Petit Chateau captivates the traveler with a stunning combination of traditional details and luxurious finishes. Both bedrooms (above and below) were designed to absorb stress and infuse guests with a sense of belonging. The first displays wooden details, while the second is completely dressed in wood. While the first bedroom was presented in soft colors with dark blue accents, the second relies on light blue and warm natural wood colors to make you feel at home. 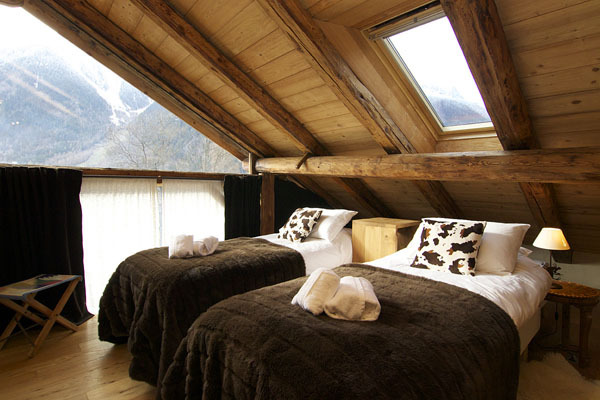 If luxury is what you’re after, Chalet Zermatt Peak in Switzerland not only offers astounding accommodation, it also features inspiring details we can use to recreate the feeling of a continuous vacation. A light-filled rustic bedroom can also display luscious textures and materials, making it a place you don’t want to leave, not even for a vacation. 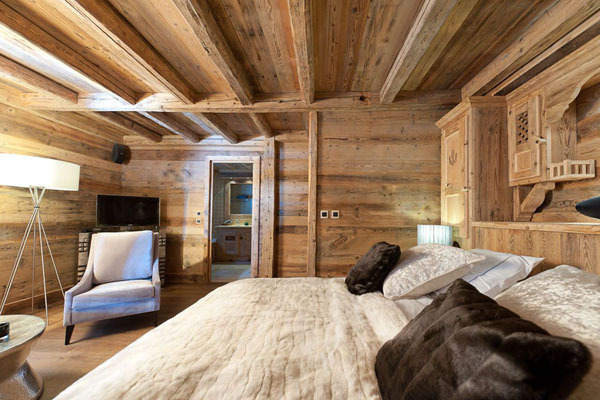 Seeing that Courchevel is a popular resort where skiing and comfort go hand in hand, we found one of the rustic bedrooms at Chalet Maria. Defined by simplicity and the extensive use of wood, the bedroom above doesn’t need anything more to be inviting–it just needs you and your love. Contemporary design introducing rustic hints is the best solution for a modern home that needs just a small amount of natural inspiration. Seeing the bedroom displayed by Chalet Grande Cerf makes us want to rethink our perspective on today’s design possibilities. Kids’ rooms can feel homey and creative even when lacking strong colors. Shades of brown and cow-patterned pillows on a wooden background are a smart choice for an attic children’s room. 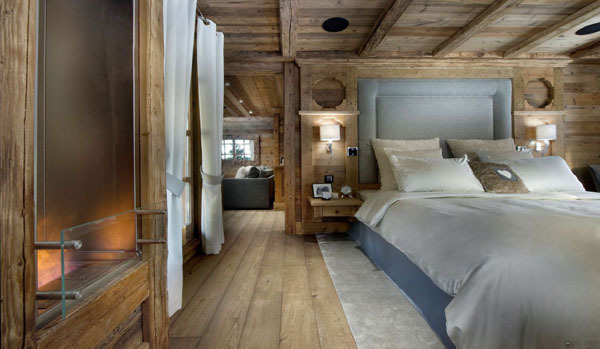 Inspiring dreams of a simple, soft-colored bedroom, the example above shows one of Chalet Bibendum‘s bedrooms. 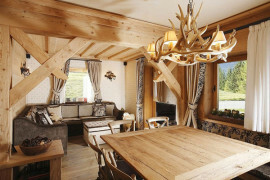 This modernly restored 300-year-old chalet proves that rustic influences can be beautifully guided to form an inviting modern space. And it has a skylight, so I’m hooked. In this eclectic bedroom by Design Associates Interiors, the branch headboards not only create a rural vibe, they also induce the feeling of sleeping in a fairytale forest. 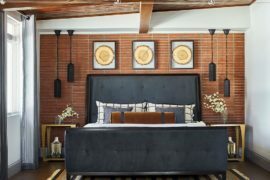 Not straying from modern style, the designers placed the two wonderful beds against a dark wood accent wall lit softly by the nightstand lamp, creating a fascinating atmosphere. 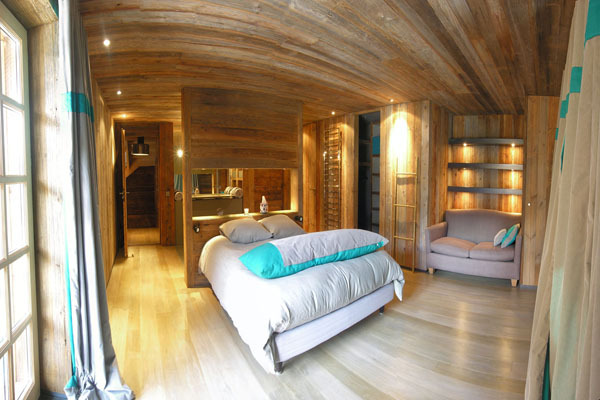 Another modern version of a rustic bedroom comes from Metropole Architects. 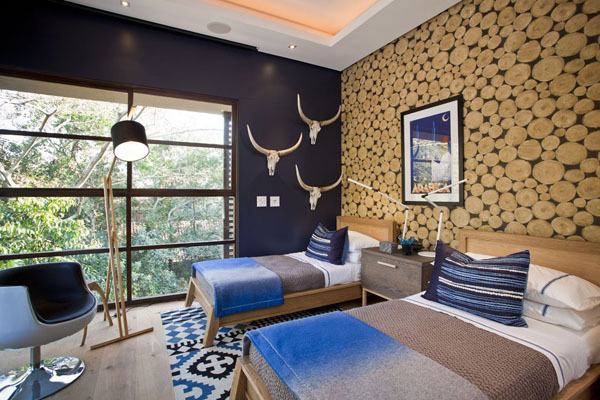 The contemporary South African residence known as the SGNW House welcomes winter coziness in one of the bedrooms by displaying timber-patterned wallpaper within a dark blue theme. Completing our list is a rustic bunk bedroom with four wooden beds under a slanted roof. Seen at Chalet Cyanella in Megève, French Alps, this amazing four-bed rest space designed by local architecture studio Bo Design lies somewhere between a relaxed atmosphere and luxurious modern living. Whichever style you prefer, if you love rustic details and crave those days when you would fill up your lungs with fresh air, the bedroom is the perfect place to decorate accordingly. This private space where you go to sleep every night must be home, as well as a room to which you truly connect. This is how a good night’s sleep starts, just before you close your eyes.